We love recycling. We promote every transition of the prevalent system of exploitation and resource depletion to something more in harmony with the planet and her fragile cycles. Recycling is a new way of being, and well understood it is a truly sustainable way of living together with the landbase and ecosystems that support us. Understanding re-cycling well means to differ it from mere down-cycling or converting stuff into less valuable stuff somewhere down the energy chain. It entails up-cycling and re-introducing old materials into the cycle. You’ve probably heard of the book Cradle to Cradle: Remaking the Way We Make Things, by American architect William McDonough and German chemist Michael Braungart. The book came out a few years ago and much has changed since then. Recycling is more popular now than ever. From a theoretical point of view, all materials are by definition recycled. It might take hundreds of millions of years, like in the case of the organic material buried in the ground eons ago and that we are more than half way sucking out of it as oil, the black gold that, as the deliberately obfuscating and intimidating slogan states “drives our economy”. Other material, like freshwater, has shorter cycles, but sadly still not short enough for humankind that is so dramatically running out of water right now as a result of global warming and over pumping. Materials like bottles, napkins, plastic bags, batteries or tin cans are returned to nature and will decompose and re-enter her system over periods ranging from a few months for the napkins to a few thousand years for the batteries and bottles. Everything is by definition recycled (yes, there’s an insight of Palinesque grandeur!) If only we wait long enough, we will get back all (petro-)organic materials we put in. The paradox of running an economy of infinite growth on a finite planet have been spelled out enough to be absolutely sure that whoever refuses to understand it does so out of evil intend or sheer brainlessness. Or, perhaps, because they find something heart-warmingly consoling in the tags on Chinese baby toys reading “ALL NEW MATERIAL”, something that makes them feel like they can escape the cycle and aspire to immortality. These poor individuals need to embrace recycling because everything is recycled – including themselves. Humans are recycled as fertile soil in a graveyard or turned into ashes that serve a more symbolical than fertilizing purpose. Basically what happens six feet under in a graveyard is the same as what happens in landfills, however much we feel the need to deny it. 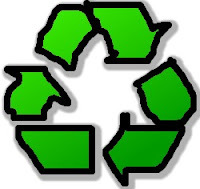 If we would embrace recycling to an extent that is already happening in garbage recycling, and treat the deceased with the same loving respect as we treat tin cans, bottles, wood chips, corrugated cardboard, and polyester fiber, that would spark a little revolution. Currently we limit the recycling of humans to hair (made into wigs), organs such as livers, kidneys, and hearts for transplant, and some scientifically interesting parts plastinated and downcycled for demonstration purposes. But we could use so much more. Skin could be tanned and made into very special purses. Bones would make good musical instruments, with intestines as perfect strings. And one day technology will have advanced so far that they can reassemble a human being from the parts. Yes, technology will have advanced so far that humans finally recognize our role in the cycles that constitute nature.